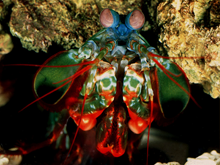 A mantis shrimp (Odontodactylus scyllarus), recently discovered to have the ability to detect the circular polarization state of light. It is not yet known what benefits this animal derives from this ability. There are two states of circularly polarized light: left circularly polarized and right circularly polarized. Light can be in any mixture of these two states, but these two states are all that are required to describe any polarization state of light. That is, the space of light polarization states is spanned by these two states. The main shortcoming of checkoff systems for performance management applications is that the "states" in the checklist do not span the space of all possible performance histories. That is, the range of possible performance incidents for human performance is not capable of being represented by any combination of the elements of a finite set of checklist elements. It is this shortcoming that creates distortions in the documentation of performance by checkoff-based systems. Photo by Justin Marshall, University of Queensland. Courtesy U.S. National Science Foundation. Performance review season in many organizations is now in full swing or just passed. As a tool of periodic reflection, performance reviews are a fine idea for accelerating employee development — in theory. But in practice, in most organizations that I've had contact with, performance reviews are downright toxic. Has serious difficulty listening to others' opinions and maintaining open, two-way communications. Has some difficulty listening to differing views and weighing them on their merits. Listens to others with an open mind; receptive to differing views. A very good listener, open to differing points of view; good two-way communications. Excellent listening skills, very receptive to new ideas; excellent two-way communications. Typically, reviewers are directed to select a single option, and then append comments in a space provided. Such systems presuppose that performance is a constant, independent of context, unaffected by circumstances, and capable of being evaluated according to a limited number of levels. Moreover, they assume that the reviewer's perspective is valid, and that with respect to the performance being evaluated, the reviewer is omniscient. For instance, although in the reviewer's experience the performer might not have been receptive to differing points of view, it's possible that the performer is being subjected to harassment by peers, outside the awareness of the reviewer. But the reviewer's knowledge of such contextual factors is not usually measured. ordered index levelsystems like these serve two purposes. First, they standardize the reviewer's responses. In the event that the organization encounters a need to justify its human resource management decisions legally, as might occur, for instance, in a lawsuit, documentation containing well-crafted phrasing can provide helpful defense. Second, checkoff systems dramatically reduce the reviewer's documentation burden, which has risen sharply as organizations have flattened. Checkoff systems provide a low-cost approach to documenting performance assessment. It's shockingly naïve to believe that a rich, varied, complex, multi-dimensional concept like performance can be captured with a single number or ordered index level. Even when we decompose performance into supposedly orthogonal properties such as listening, communicating, job skills, total output, and so on, it is at best questionable to believe that we can attach a rating to each attribute and then use that data arithmetically to compose a meaningful overall rating result. Still more shocking is the belief that we can compare the relative values to the organization of the performance of two individuals by comparing their ratings. Would you like to see your comments posted here? rbrenrVjDycBYkrNUWLQRner@ChacfSfDkcuxEUXyVGbaoCanyon.comSend me your comments by email, or by Web form. I offer email and telephone coaching at both corporate and individual rates. Contact Rick for details at rbrenDidufgSVQfwSQsXAner@ChacjtivOcMzhrQBtzGaoCanyon.com or (650) 787-6475, or toll-free in the continental US at (866) 378-5470.